After a couple of weeks of indifferent weather combined with domestic chores, it came as a relief to have a free day and a good weather forecast. 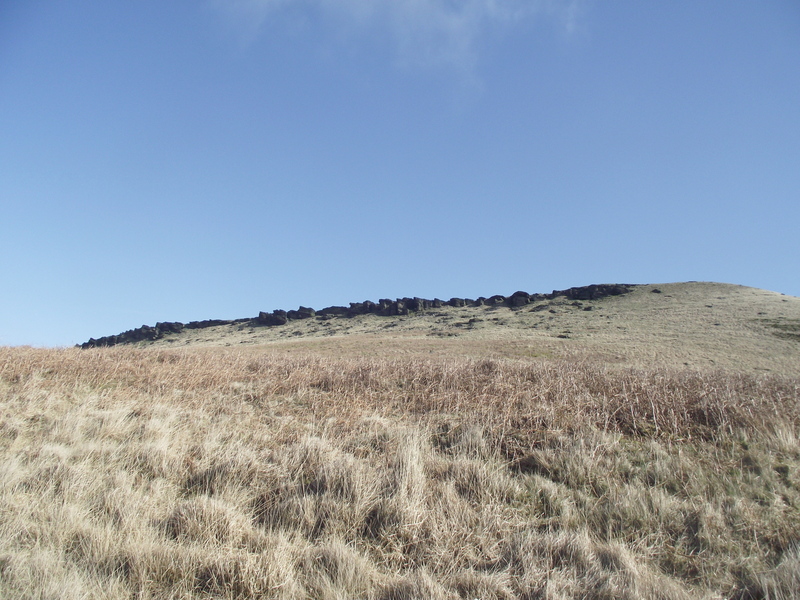 It didn’t take long to prepare a couple of rucksacks, and even less time to decide where to go – time to fill in another gap in my Peak District knowledge. Only in this case we didn’t actually walk in the ‘Peak’ – we did park the car there, though. 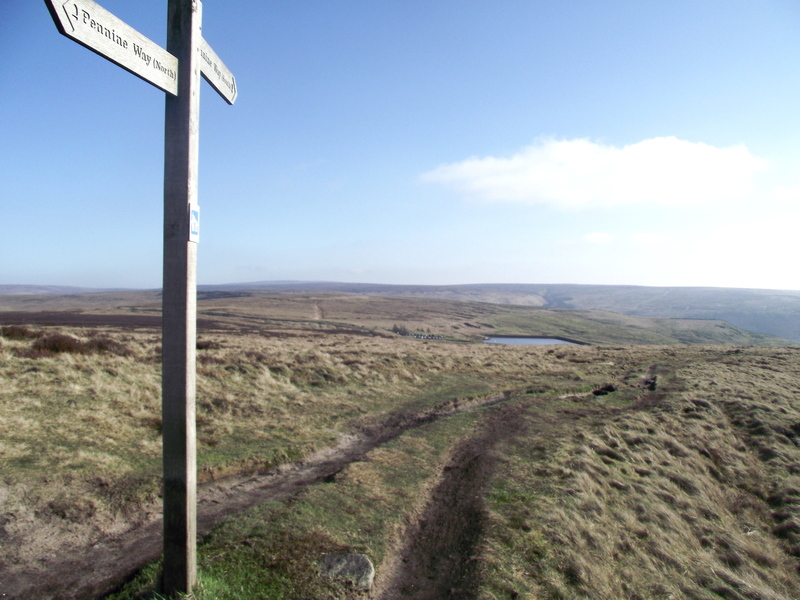 Today we were heading for the StandedgeTrail. As well as writing a blog, I also enjoy reading blogs written by others, especially outdoor blogs. As well as being an entertaining read they also sometimes provide a bit of inspiration. For example, I had no idea where Marsden was, but Mark Kelly frequently wanders the hills round there in his “Halfway Hike” blog. So, it was time to go and check out his stomping ground. We parked up near to Redbrook Reservoir, about five metres inside the ‘Peak District National Park’. 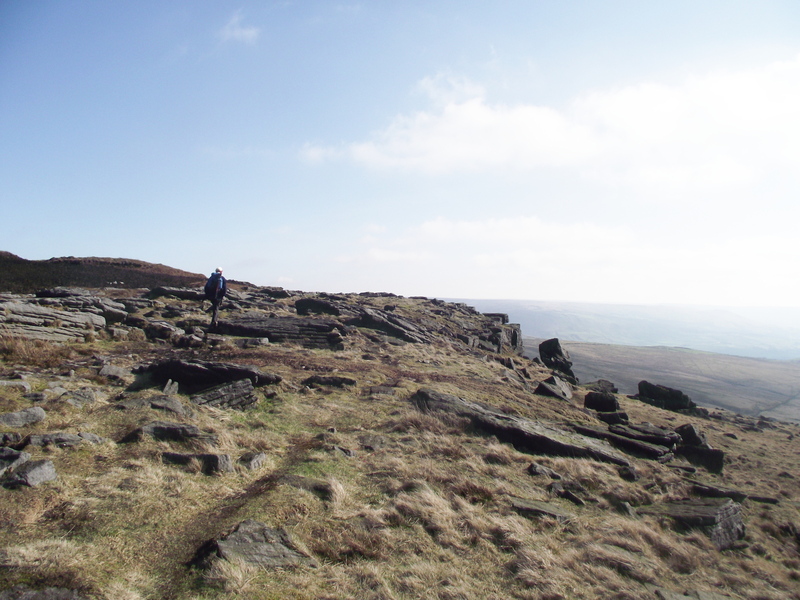 Having done so, we grabbed rucksacks and headed down the Standedge Trail towards Marsden. There was a bit of logic here, well in my mind anyway. 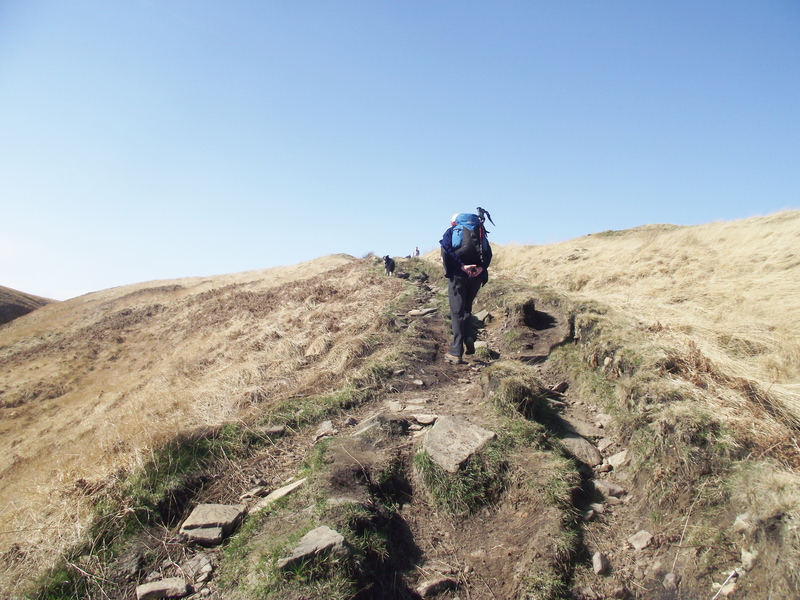 It seems counter-intuitive to finish a walk by having to go uphill, so the plan was to start by losing 125 metres altitude, before climbing 225 metres to the high point on the Pennine Way, then descending 100 metres to finish. 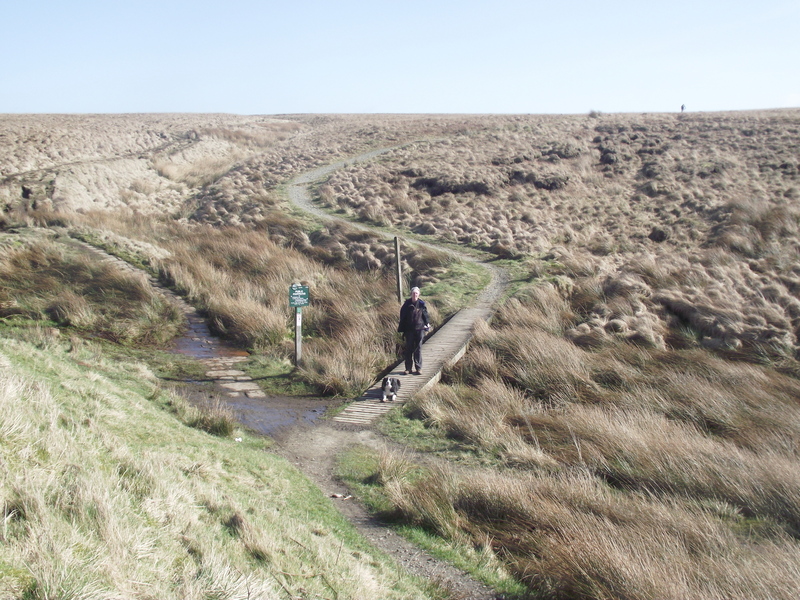 The Standedge Trail below Pule Hill was easy to follow. 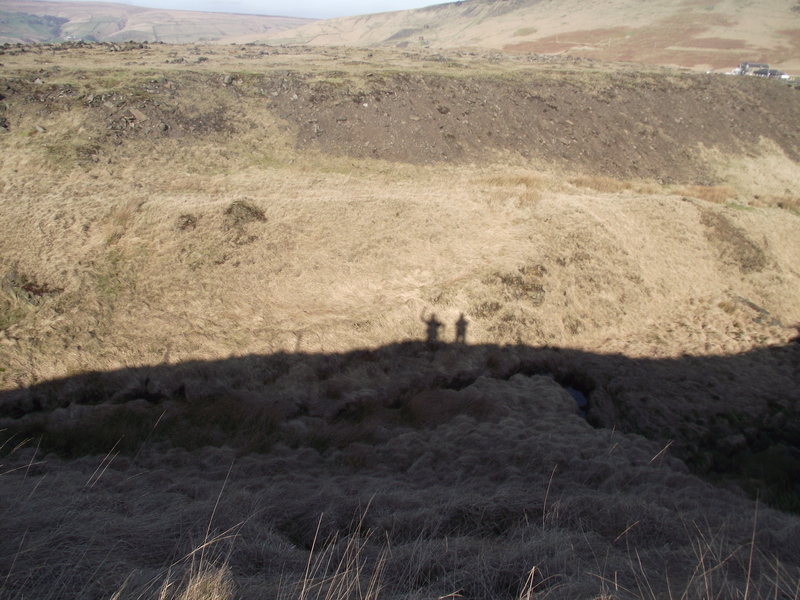 On the way down we passed a couple of shafts providing ventilation for the railway and canal running under our feet. Construction of the canal and three mile long tunnel started in 1794, but the project was beset by problems, including a miscalculation that almost resulted in two parallel tunnels! Finally finished in 1811, the canal was soon superseded by the railway, but was restored for recreational use in 2001. 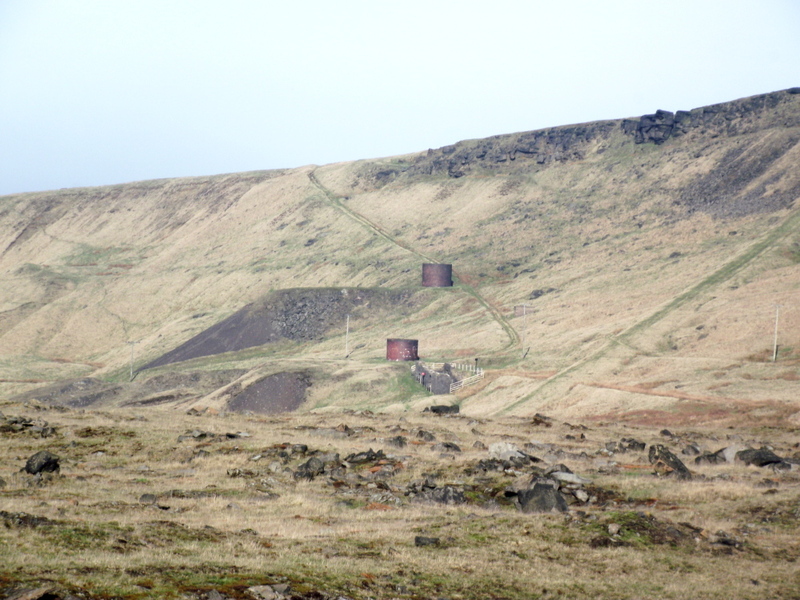 The ventilation shafts were a major part of the scenery until we started the uphill section along Willykay Clough Bridleway, but the distinctive shape of Pule Hill was visible for most of the way. 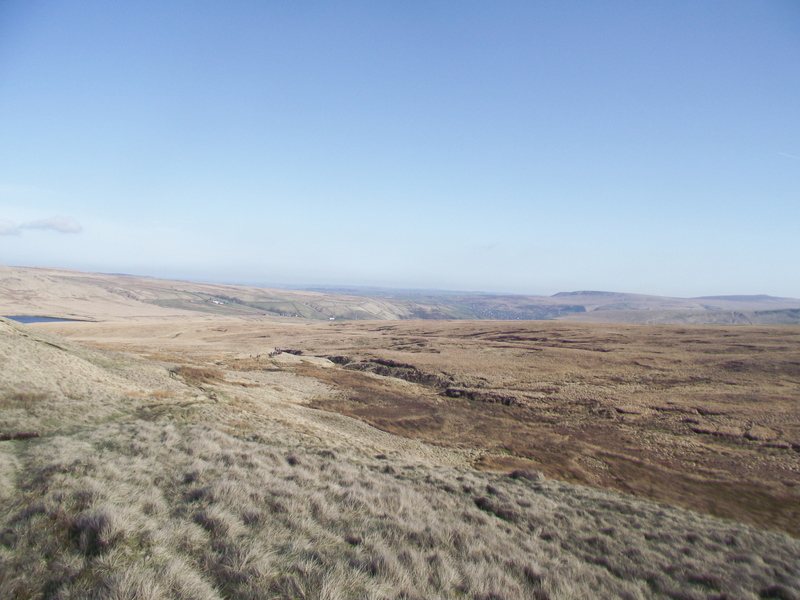 A steady height gain on the bridleway gave us good views down to Marsden over open Moorland, as we passed to the south of March Hill. 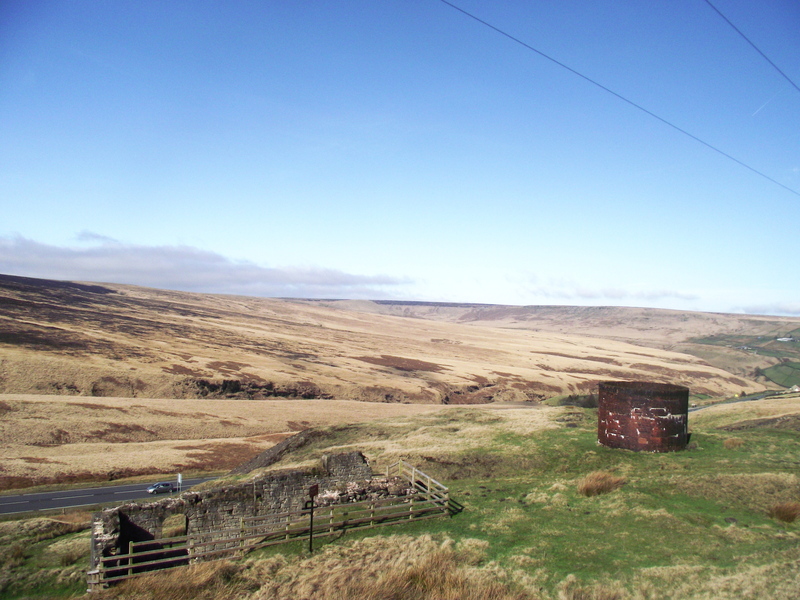 Looking back down towards Marsden…..
Before long we arrived at the A640 road at Haigh Gutter – the last time I had been here was on the Spine Race two months earlier, watching the competitors heading north on the Pennine Way on a dark, cold night. From the A640, the Pennine Way was initially well surfaced and easy going, but before long we were amongst rocks on the gritstone edge. 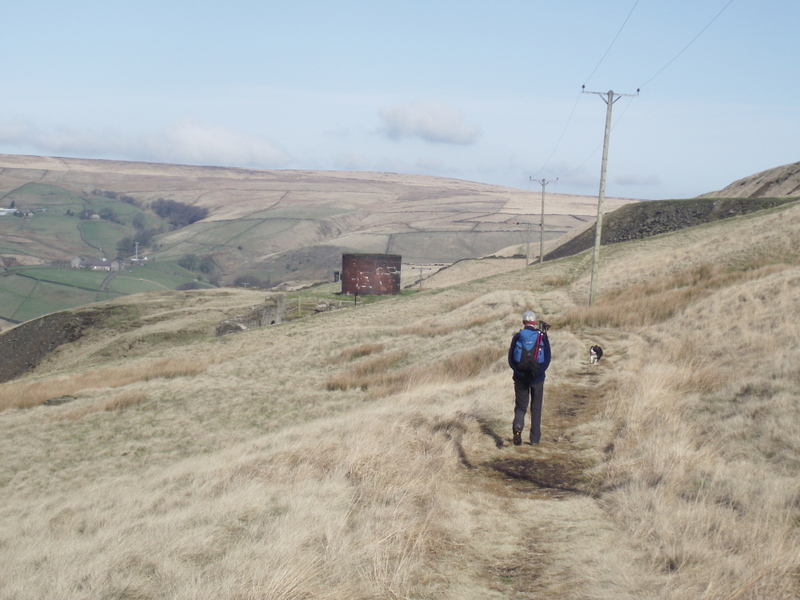 After a section of rougher walking we arrived at a parting of the ways, with the Pennine Way heading straight down to the A62 at Brun Clough Reservoir. 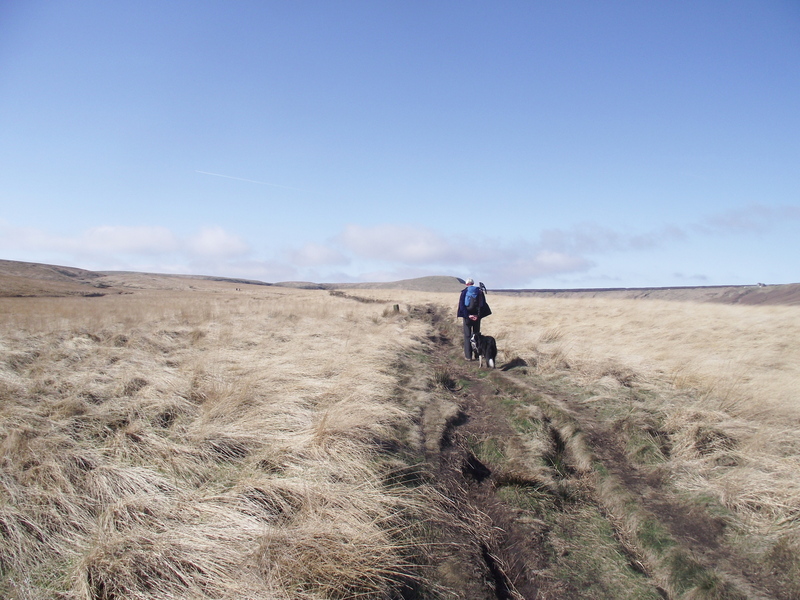 Here we turned left, heading back towards Pule Hill again. 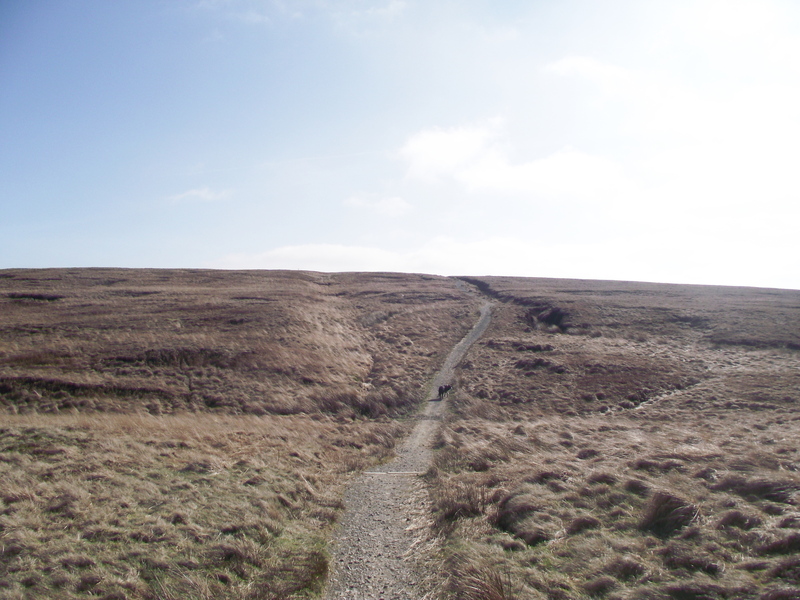 The Pennine Way – easy going at first…. We had parked the car conveniently near to the ‘Great Western Inn’, which seemed to be a good idea at the time. The first question we usually ask at a pub is, “Can we bring the dog in?” For a surprising number of pubs, this is no problem. This time I didn’t get further than the door – a sign said “Boots to be removed before entering”. I’m rarely so desperate for a drink that I’ll start removing boots or any other clothing for that matter, so we called it a day. 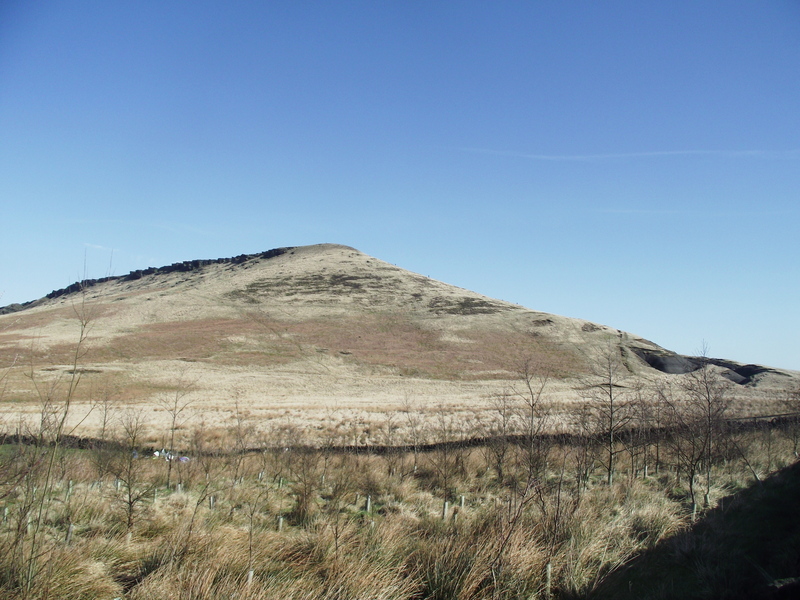 ‘The day we didn’t go up Pule Hill’, in fact. Journey’s end, but no boots inside! This entry was posted in 4. 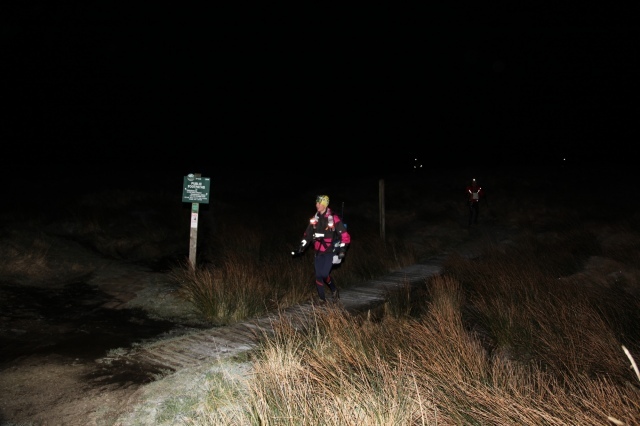 Northern England and tagged hillwalking, Pennine Way, photography, Spine race. Bookmark the permalink. 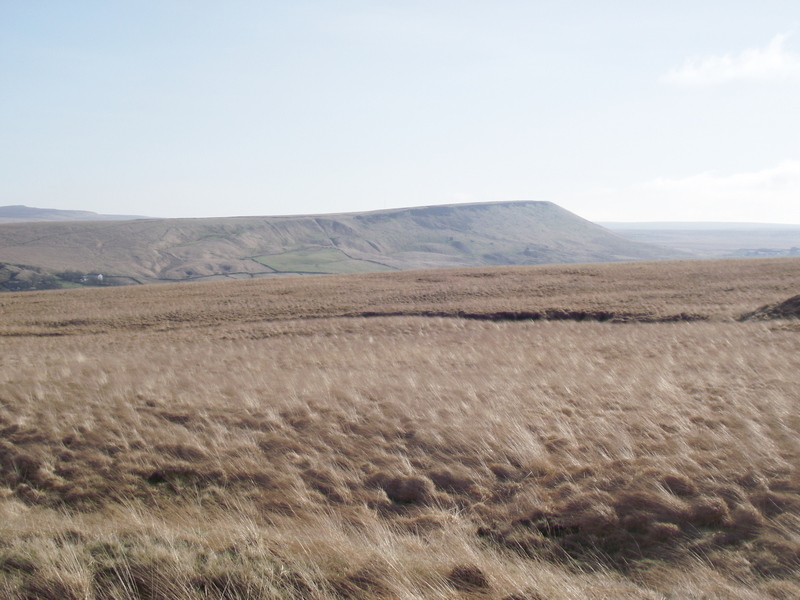 These Pennine hills combine a sense of being wild and remote whilst being quite small. It’s easy to see why the outdoors movement in the last century was focused on these hills, where this mini-wilderness was accessible to thousands of working people. 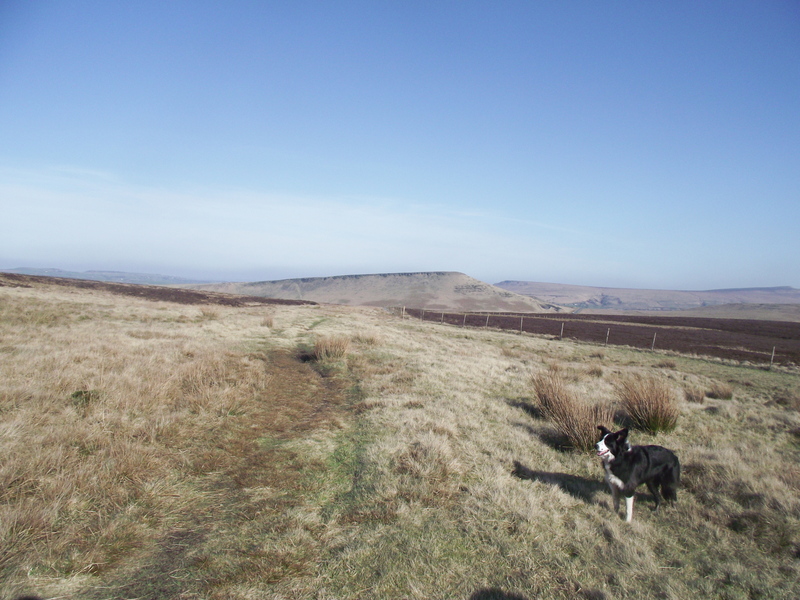 Looked like a super day for a walk – I know the area well. 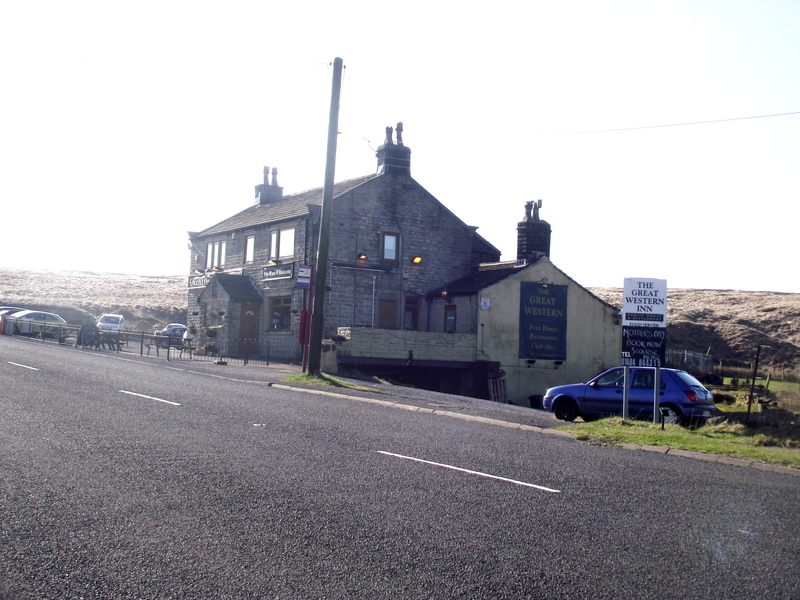 When I was on the Pennine Way, the day I dropped into Lothersdale I planned to have a drink at the pub. I took my rucsac off, tied Dixie up to a bench outside, walked to the door – and then saw the ‘no boots’ sign. Sorry, but they’re not going to have any of my money with a rule like that, no matter how thirsty I was! 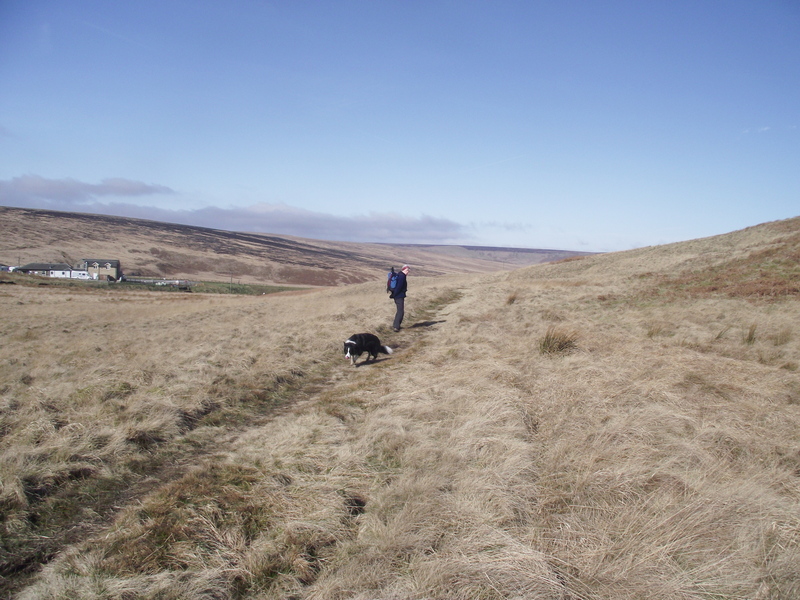 BTW you are next on my ‘hit’ list – your trip report for Alport Castles was so good that Chris and I (and t’dog) went out and repeated it a couple of days back – it will be in the blog next Monday. Thanks for the route and for the inspiration!! I’ll put a link in to your blog when I post. Unfortunately, although we should have just walked out again, we didn’t and paid an arm and a leg for our two soft drinks! That’s another pub which must be fairly frequented wi’ farmers when it isn’t full of walkers! That used to be one of the roughest cavers pubs in the Dales in the late 60’s/early 70’s!! There was a choice of CB (cheap beer) or DB (dear beer), though the wags reckoned it really stood for ‘chucking beer’ and ‘drinking beer’ – the beer fights there were legendary! !